Peniel Tech , an international provider of advanced IT solutions, services and support.Peniel Tech provides a range of end-to-end services to support your IT infrastructure and prepare your business for the evolving technological landscape.Our comprehensive suite of services ensures complete support pre-, during and post- implementation. This can range from full project management and execution to one-off services that complement the expertise of your own IT department.By delivering competencies and knowledge to address any gaps in your in-house team, we are able to help you realise your IT aspirations with ease and efficiency and ensure your IT capabilities are fully aligned with your organisational strategies. With an impressive collection of multi-vendor accreditations, our team of skilled consultants are able to deliver an exceptional level of expertise across an extensive range of products. This means we are able to offer advice and support to optimise both your existing equipment and any new systems you are looking to invest in. We provide desktop support services for any small, medium or large-scale business; particularly those may not have a dedicated IT professional working onsite or perhaps where the level of desktop support required is highly specialist. Peniel Tech also helps you manage your technology expenses with a variety of flexible service options for your desktops. Services include hardware maintenance & support, software support, new technology deployment, remote office support and more. We also offer Annual Maintenance Contracts. The world now revolves around the pulse of web world and so even if your site went down for a few minutes, there are chances that you will loose a potential customer. And recurring server downtime will drag away your existing customers to your competitors. Your company deserves the best server support, and that\'s where server management companies like us come in. 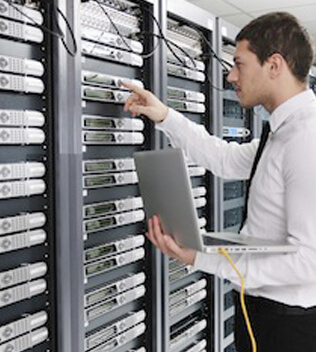 Our team has vast experience in managing Linux and Windows servers. Our server support includes following Linux flavors CentOS(5.x,6.x,7.x), RedHat(5.x,6.x,7.x), Ubuntu and Debian. Peniel Tech, the #1 network infrastructure company in UAE , offers you a highly secure and reliable IT infrastructure at an affordable price. The IT infrastructure in your office plays an important role in your business, in other words computer networking is the core of your technology infrastructure. Our well trained and highly qualified professionals integrate advanced technologies and make your network faster, stable and secure. With the network setup from Ortus, you are absolutely away from your network problems. A firewall employs packet filtering to allow or disallow the flow of very specific types of network traffic. IP packet filtering provides a way for you to define precisely what IP traffic is allowed to cross the firewall. IP packet filtering is important when you connect private intranets to public networks like the Internet. There are two approaches to using a firewall with a VPN server: • The VPN server is attached to the Internet and the firewall is between the VPN server and the intranet. • The firewall is attached to the Internet and the VPN server is between the firewall and the intranet. Virtualization, in computing, refers to the act of creating a virtual (rather than actual) version of something, including but not limited to a virtual computer hardware platform, operating system (OS), storage device, or computer network resources. Delivers comprehensive, adaptive, highly efficient agentless and agent-based protection, including anti-malware, intrusion detection and prevention, firewall, web application protection, integrity monitoring, and log inspection. A VoIP phone or IP Phone uses Voice over IP (Voice over Internet Protocol - VoIP) technologies for placing and transmitting telephone calls over an IP network, such as the Internet, instead of the traditional public switched telephone network (PSTN).Digital IP-based telephone service uses control protocols such as the Session Initiation Protocol (SIP), Skinny Client Control Protocol (SCCP) or various other proprietary protocols. We offers comprehensive telecom services, including purchase, setup, configuration, integration, maintenance, training, consulting. Peniel Tech provides call management software with advanced call management features to give you the information you need, whether for the whole company, by department or by individual extension.We also provide voice processing systems which allow you to record, send and retrieve messages 24 hours a day all year round world-wide, and help to efficiently handle your telephone system traffic and internal communication needs. The voice processing systems can improve the efficiency of your business, whether it be in sales, customer service, marketing or human resources. IVR - short for Interactive Voice Response - Automates interaction with telephone callers. We provide IVR products and services that dramatically reduce the cost of common phone calls to and from your company. We help setup and manage your own IVR platform and develop customized voice solutions to suit your needs. Our corporate focus is to remain the most customer-oriented vendor in the IVRS market. This unique focus has led to commercial success in a time when most companies have suffered dramatic declines. As Telecommunication has become the most complex ecosystem and considered to be one of the top five most expenses in many organizations. Sometimes it gets almost impossible to analyze the increasing expenses, People on top positions like Managers, Business Head are realizing the need to get visibility, accountability and control over spend. It’s the right time to stop at us and arrive at the next generation solutions which provide real-time cost effective analysis in no time. We helps organization understand the spending pattern, reduce manual intervention, reduce fraudulent charges and helps you save costs. Accountability should be the prime focus of the organization, where expenses on the bills be audited with the help of technology. Peniel’s team is highly proficient in using PBX software packages to implement voice mail, conference calling, interactive voice response (phone menus), and automatic call distribution. We also has a full fledged team for EPABX service,networking,CCTV Surveillance etc. in kochi,dubai,abudhabi. etc.. Our team got the number one customer satisfaction ill now.